UKTI Strategy and FCO Business Charter put new focus on trade and investment for growth. Business Secretary Vince Cable, Foreign Secretary William Hague and Trade and Investment Minister Lord Green today launched a new cross-government focus on trade and investment to help the British economy grow. The UK Trade & Investment (UKTI) Strategy and the Foreign and Commonwealth Office (FCO) seven-point Charter demonstrate the Government’s dedication to supporting international business, championing UK business overseas and attracting investors to the country. They form a core plank of the Government’s Plan for Growth, and recognise the fact that a new focus on business is needed if the UK is to remain economically competitive in the years to come. Establishing a new private sector delivery partner with the incentive to attract and retain high value investments. Expanding the Global Entrepreneur Programme (GEP) to win more investment to the UK. “We’re rightly proud of British firms and making sure they can increase their exports to a worldwide audience is vital if we are to rebuild our economy. We also know the UK already has a great reputation as a place to do business and we want to do all we can to make sure foreign investors come here. “The Charter for Business is part of our commitment to inject a new commercialism into the Foreign Office, using our international influence to help British businesses secure new trade opportunities. “We will work tirelessly to champion UK business abroad and to help attract investment to the UK. “Businesses will be able to capitalise on the FCO’s in-depth local expertise to identify and exploit opportunities. Ministers will continue to build the strong bilateral political relationships needed to help business thrive, as well as working to influence trade policy internationally. The documents launched today reinforce the Government’s desire to place the nation’s commercial interests at the heart of its foreign policy. Both were developed in consultation with industry leaders and signal that Britain is, and remains, ‘open for business’. Trade and Investment for Growth, a White Paper published in February, set out the Government’s plans to rebalance the economy through an ambitious framework for trade and investment. UKTI’s Strategy and FCO’s Charter are the next step in this process. The Government is now looking in more detail at how it works with businesses, especially small and medium-sized enterprises (SMEs), and what action can be taken to make this more effective. “The Strategy we have developed builds on our successes to date but this is not business as usual by any means. “As UKTI seeks to become more entrepreneurial, it will bring more private sector expertise into its relationship with exporters and inward investors and develop new partnerships with key businesses which support SMEs. Developing new partnerships with key businesses which support SMEs, and using their networks to raise awareness of the benefits of exporting. Creating a new online self-help community for UK SME exporters, so that they can support each other and share experience as they seek to internationalise their businesses. This new development will also provide a continuous feedback loop so that customers can tell us what they think of UKTI. These actions will help to develop new ways of relating to businesses, with a renewed focus on partnerships with the private sector to boost productivity and improve performance. 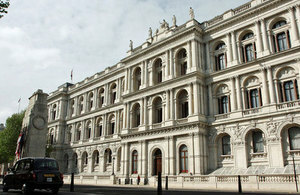 The FCO Charter will focus on using FCO resources to meet the needs of British business. It is part of the FCO’s work to drive lasting prosperity for the UK, setting out the specific contribution that the FCO will make to support business across the world. Embassies and High Commissions overseas will continue to champion the UK as an excellent place to invest and do business. The FCO Charter, together with UKTI’s Strategy, will be available to UK businesses from today to demonstrate the support available to them and where they can access this to boost their work internationally. Companies tell UKTI that its support to exporters has helped them generate £6 billion of profit for the UK economy. This additional profit has helped generate more than 126,000 jobs in the UK. Last year, UKTI played a role in securing 759 investment projects, nearly half of the national total. These projects helped generate more than 40,000 jobs. For every £1 spent, UKTI generates £22 for the UK economy. In October 2010, UKTI was named as the best Trade Promotion Organisation in the Developed World. Ninety per cent of UKTI’s customers are small and medium-sized businesses. UKTI has a network that extends to almost 100 overseas markets, which generate 98% of world GDP. It also has a presence in the UK regions and online at www.ukti.gov.uk.